We have over 20 years experience of dog and cat boarding. 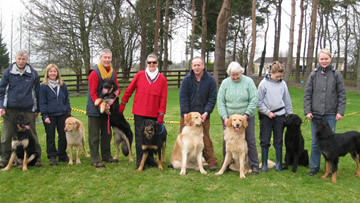 Our present dog boarding kennels and cattery facility was opened in June 2003. It was designed and built to offer your dogs and cats a happy and safe home from home. This property and its location were specifically chosen with boarding kennels in mind, just 5 minutes drive from M7 and 12 minutes from M4 making it ideally situated for those in Kildare, Dublin and surround areas of Leinster, Ireland . It is a tranquil and peaceful location set on 12.5 acres in the beautiful rural environment of Sallins, Co. Kildare along the banks of the Morell River. Our home is 150 meters from the pet boarding facility so someone is on the premises at all times. Canine Country Club and Cattery Provides your pet with Top Quality affordable boarding whilst you are on holidays. Relax and enjoy safe in the knowledge that your pets are having a good time in a safe and secure environment. In order to insure the health and safety of our boarding friends ALL Pets must be current on their Vaccinations incl. (Kennel Cough for Dogs). No Exceptions. Vaccination Policy Strictly Enforced. When a pet is stressed, the immune system can drop which would allow dormant disease symptons to occur. For this reason we advise against boarding your pets less than 5 months of age.